To humans, being right-handed or left-handed plays an important role. The majority of people are right-handed, while only about 3 percent of people innately use both hands equally well. Preferring one side of the body over another is not unique to humans: the phenomenon occurs in the animal kingdom as well, for instance in great apes or birds, although their "handedness" is typically not as obvious as it is in humans. "Handedness" is particularly pronounced in cichlid fish of the species Perissodus microlepis, which is endemic to Lake Tanganyika in Africa. This cichlid is highly specialised, living exclusively on the scales of other fish obtained from only one side of the bodies of their prey. 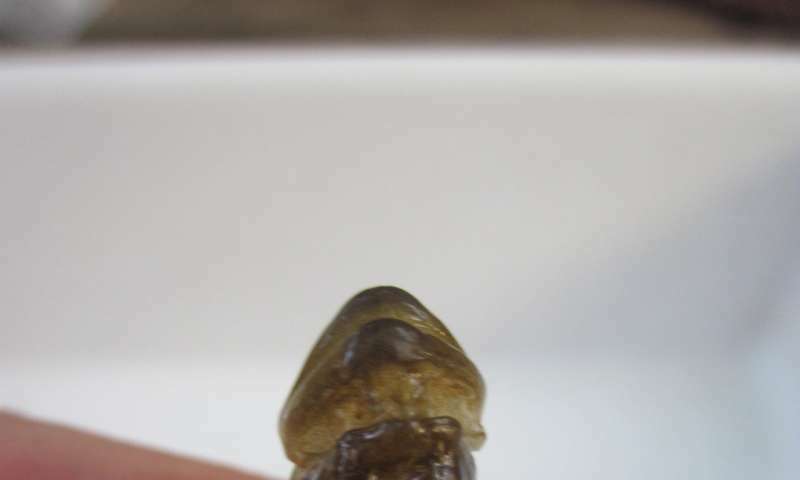 When hunting, not only do individual fish display a pronounced predilection for attacking their prey from one direction, this preference is also mirrored by the shape of their heads. Many individuals of this cichlid have asymmetrical jaws that bend to the left or right. Biologists from the University of Konstanz examined the relationship between the cichlids' preference for one side, the structure of their brains and their gene expression. A team led by Professor Axel Meyer, Professor of Zoology and Evolutionary Biology at the University of Konstanz, was able to demonstrate that the preference for one side in the animal's feeding behaviour correlates with a corresponding asymmetry of the cerebral hemispheres, as well as unequal gene expression between the hemispheres. The research results have been published in the current issue of Genome Biology and Evolution. "Our research helps us to understand handedness and hemispheric asymmetries better. We hope that our results also will contribute to further our understanding of handedness in humans," explains the Konstanz biologist Dr Ralf Schneider, who, along with Dr Hyuk Je Lee, is one of the lead authors of the study. 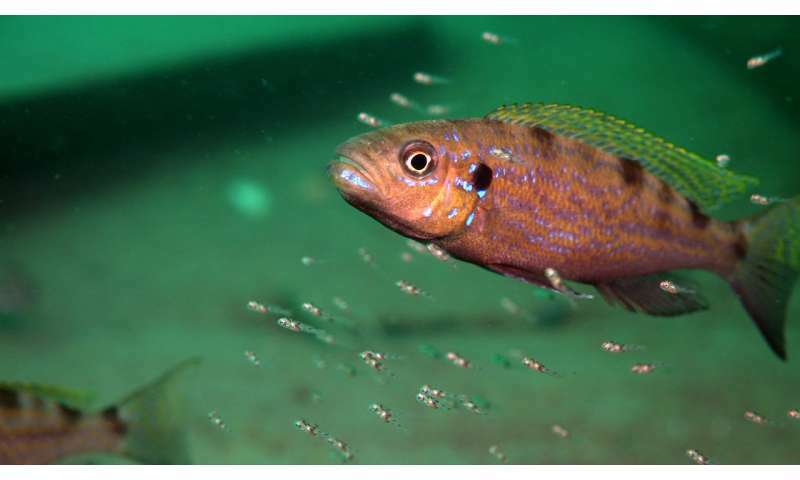 In their study, the biologists documented the preference for one side of approximately 40 individual cichlids, followed by an examination of their brains. "We found a clear asymmetry across the animals' brains, especially in the Tectum Opticum region of the brain. However, this asymmetry was present only in individuals who displayed a distinct preference for one side when hunting," says Ralf Schneider. The Tectum Opticum is the region in the brain responsible for processing vision. In the respective cichlids, the hemisphere of the Tectum Opticum that controls the eye on the preferred side of the body was more strongly developed than the other. Individuals that did not display a marked preference for one side showed greater symmetry within the Tectum Opticum. The same proved true for other regions of the animals' brains. "This is interesting because it suggests a functional relationship between the shape of the brain and behavioural laterality," says Schneider. Analyses of the genes (gene expression profiling) across several parts of the brain showed which genes tend to be expressed more strongly in the respective regions of the brain. The analyses revealed similar patterns to what the researchers had found in the fishes' brains structures: in the Tectum Opticum region alone, as much as 140 genes showed differing activity in the two hemispheres – corresponding with the animals' preference for one side, gene activity in the respective hemispheres of the brain was increased or decreased. The most pronounced correspondence was determined for the gene synuclein gamma alpha (sncga) – a particularly interesting result because previous studies on zebrafish have shown that this gene is expressed predominantly in the so-called habenula, a part of the brain that is asymmetric in all vertebrates, including humans. Besides synuclein gamma alpha, a range of other genes, some of which are associated with handedness and schizophrenia in humans, showed expression patterns in the brain hemispheres of the cichlids that suggest a link to handedness. There is reason to believe that some asymmetries in the brains of vertebrates could have originated in the habenula's asymmetry. The cichlids' preference for feeding on scales from just one side of their prey's body, as well as the asymmetrical shapes of their heads and brains, probably evolved due to the extremely fast "side-specific" development of gene regulation in their brains, the biologists suggest.